That verse is packed with so much. King Solomon had many women before him. As women, we can relate to feeling lost in the middle of a group. Unable to stand out. We compare ourselves and our bodies to the women beside us. For whatever reason, it’s how we are wired, and we have a love/hate relationship with it. But what does God say? 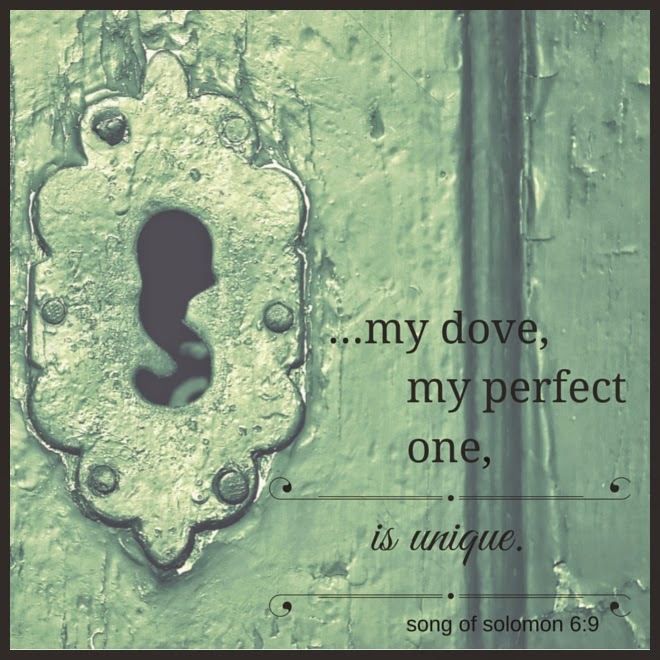 See, the Song of Songs was written really from His heart to ours, He simply used Solomon as a stand-in. Knowing that fact makes the above Truth stand out all the more. He’s saying that no matter how many people surround us, no matter how our voices may blend with theirs, how our stories may sound similar, our abilities overlap, or even how we may see their reflection when we look in the mirror, we are unique. A one-of-a-kind where God is concerned. Oh, He may have created us similar to others in many ways, but He did not use the same mold. No carbon copies here. Reread today’s verse. It makes a point of showing a roomful of women, and yet God’s Beloved (hint, that’s you) isn’t lost inside. He sees her and calls her unique. Similarities are wonderful. They draw us together as friends, allow us to help each other along life’s path, even double our power when reaching others. Yet it’s our tiny little differences that make a huge impact on the world. Differences that we may not be able to spot, but that God put in us and wants to cultivate if we’ll let him. To do that we need to stop thinking we are lost in a crowd and start realizing that no matter how much we may look like the person beside us, we are 100% unique. Lord, help us today to see the unique abilities you’ve given us. Open our eyes to the way our stories and talents are different from those around us. Give us fresh eyes to the matchless person you created us to be and flood us with excitement and ideas on how we can best reach others for you. I appreciate how you speak life-giving, encouraging truth in your blog posts, Susan. Thank you for this reminder.